Vice President Mike Pence, accompanied by his wife, Karen, returned to NASA’s Kennedy Space Center in Florida on Feb. 20, this time to chair a meeting of the recently re-established National Space Council. During his first Kennedy visit on July 6, 2017, Pence spoke to center employees and toured numerous facilities supporting ongoing work at the premier, multi-user spaceport. 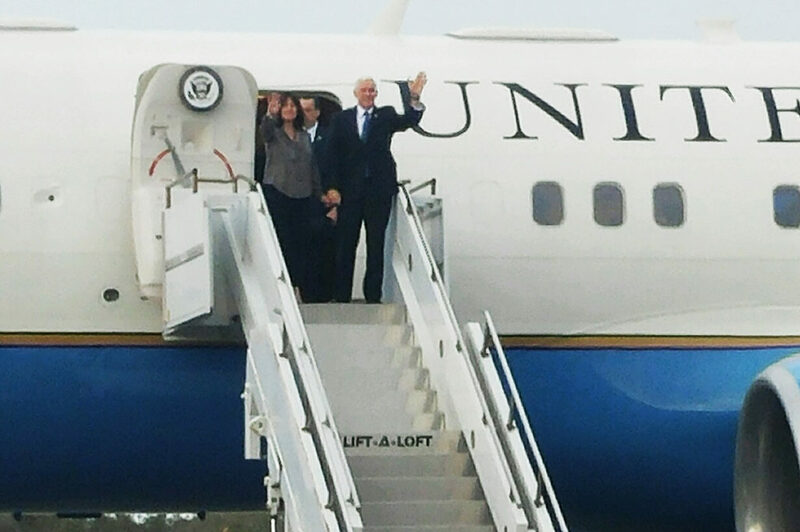 After his arrival today, Vice President Pence will tour facilities at both Kennedy and Cape Canaveral Air Force Station. He also plans to participate in a commercial spaceflight federal reception. The primary focus for the vice president’s trip will be the second meeting of the National Space Council set to take place in the high bay of the center’s Space Station Processing Facility. The event’s theme is “Moon, Mars and Worlds Beyond: Winning the Next Frontier” and is slated to include testimonials from leaders in the civil, commercial and national security sectors about the importance of the United States’ space enterprise. The National Space Council’s role is to advise the president on America’s space policy and strategy, and review the nation’s long-range goals for space activities. The council includes leaders in government from both civil and military space programs. 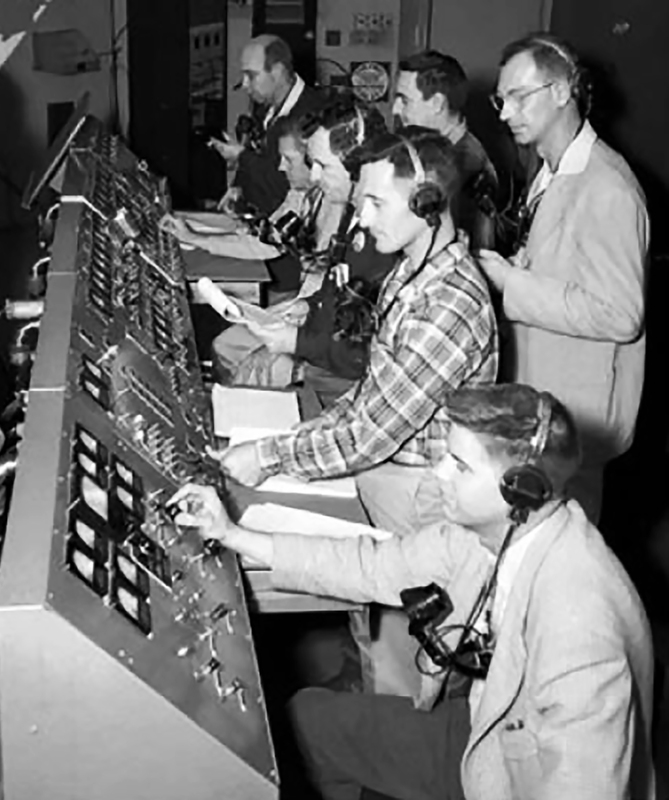 The council’s historic roots go back to the earliest days of NASA when the agency was established in 1958. Through 1973 it was known as the National Aeronautics and Space Council. From 1989 to 1993 the group was the National Space Council, guiding NASA and helping achieve the agency’s ambitious milestones. On June 30, 2017, President Donald Trump signed an executive order re-establishing the National Space Council to streamline and coordinate national space policy. The first meeting of the new National Space Council took place Oct. 5, 2017, at the Smithsonian National Air and Space Museum’s Steven F. Udvar-Hazy Center in Chantilly, Virginia. Afterward, acting NASA Administrator Robert Lightfoot praised the vice president for calling for renewed U.S. leadership in space with NASA helping lead and shape the way forward. The magic number for NASA’s Launch Services Program (LSP) at Kennedy Space Center in Florida could be six. That’s because there are six primary missions scheduled to launch from two different coasts, within about six months, atop six different rocket configurations. Read the full feature at https://go.nasa.gov/2GzP86u. View the Launch Services Program 2018 video at https://youtu.be/RdWPclPyzis. 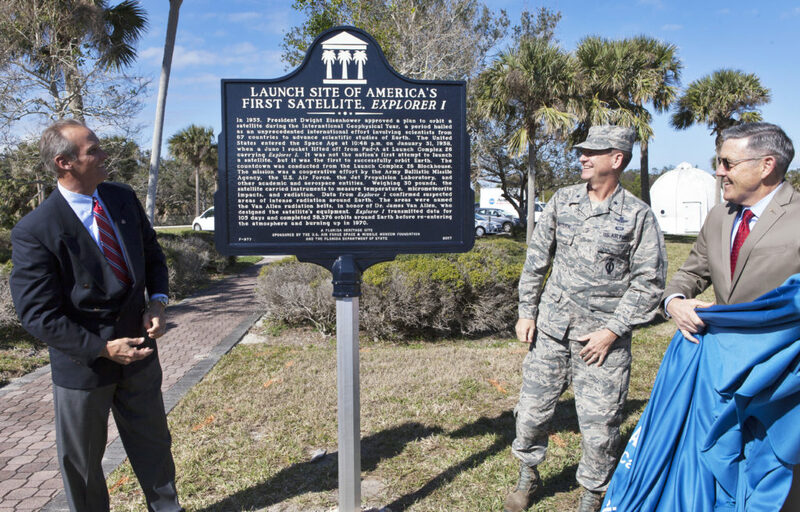 During a ceremony at Cape Canaveral Air Force Station’s Space launch Complex 26, a historical marker is unveiled noting the launch of America’s firs satellite, Explorer 1. From the left, Ray Sands, chairman of the Air Force Space and Missile Foundation; Brig. Gen. Wayne Monteith, 45th Space Wing commander and director of the Eastern Range; and Kennedy Space Center Director Bob Cabana. 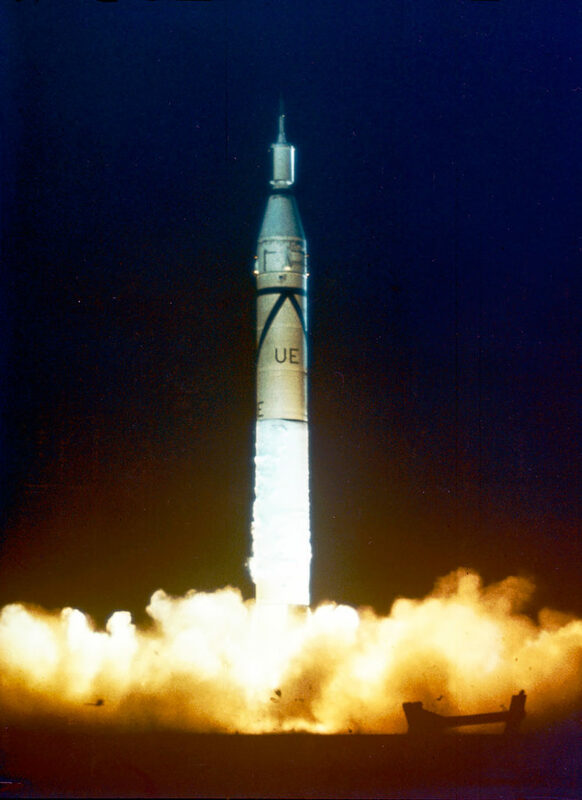 The Explorer 1 satellite was launched atop a Jupiter C rocket on Jan. 31, 1958. NASA and other government officials gathered at Cape Canaveral Air Force Station’s Launch Complex 26 to mark the beginning of U.S. space exploration. From that location, on Jan. 31, 1958, a Jupiter C rocket lifted off with America’s first satellite — Explorer 1. The launch site now is part of the U.S. Air Force Space and Missile Museum, where the ceremony took place on the 60th anniversary of the event in which the United States was in a Cold War competition with the Soviet Union to orbit satellites. Brig. Gen. Wayne Monteith, 45th Space Wing commander and director of the Eastern Range, noted that America’s first satellite paved the way for more achievements in the years to come. Also on hand was Dr. John Meisenheimer, launch weather officer for Explorer 1. Due to high upper-level winds on Jan. 29 and again on Jan. 30, he gave a “no-go” forecast. According to Kennedy Space Center Director Bob Cabana, the years since Explorer 1 have brought many achievements. The United States’ first satellite, Explorer 1, is launched into orbit by a Jupiter C rocket at 10:48 p.m. on Jan. 31, 1958. Explorer 1 confirmed existence of high-radiation bands above the Earth’s atmosphere. Following the successful launch of Explorer 1, the satellite’s cosmic ray detector discovered radiation belts around Earth held in place by the planet’s magnetic field. The belts later were named for Dr. James Van Allen, professor of physics and astronomy at the University of Iowa. As the principal investigator, he developed the instruments for the Explorer 1 satellite. Since opening to the public in 1966, the Air Force Space and Missile Museum has introduced millions of visitors to the history of rocketry and spaceflight. Inside the blockhouse, much of the instrumentation remains as it was in the 1950s when America was taking its first steps into space. For more historical photographs and pictures of the Jan. 31, 2018, event, check out the Explorer 1 60th Anniversary Flickr album.